Tayari Jones has been publishing novels since 2002, but it was her teaching jobs that always paid the bills. Then her fourth book, An American Marriage, was selected for Oprah’s Book Club a year ago and became a runaway hit. In August, Barack Obama shared with his 54 million Facebook followers that Jones’s book was one of his favorite summer reads. More recently, Oprah announced that she’s adapting it for a movie. Here, Jones — who is also a professor at Emory University in Atlanta — talks about the struggle to get published, why she never thought her writing would pay the bills, and what she bought with her first big royalty check. My mentor, the playwright Pearl Cleage, used to say to me, “You want to be paid for your writing, but you don’t want to have to write for money.” So I never planned for writing to be the way I support myself, because I didn’t want to put that pressure on it. My parents are professors, so going that route was not a huge leap for me. In graduate school, I had a book agent, and I was so horrible around my classmates. I’d be dropping, “Oh, I have to call my agent. Oh, my agent this, my agent that.” Then that agent dumped me, so I learned a lesson that has carried me the rest of my life: I brag about nothing, ever, because anything could be taken away in an instant. I had to find another agent, which I did, and it took her a long time to sell my first book. I took up quilting and all these other things to pass the time while I waited for her phone call that I had a book deal. I didn’t want to call her, because I didn’t want to annoy her so much that she’d dump me, too. After eight months, she called and said, “We’ve got a deal.” This was before cell phones, and I called everyone and no one was home. I couldn’t reach anyone. I was sitting in my apartment and I had this bottle of Champagne I had bought months before, and I was like, well, I guess I should open it. I drank some of it and I just sat there by myself. I never made much money from my first three books. The only book I ever got any royalties off of was Silver Sparrow, and it was enough to take a trip every year. I’d go somewhere and be like, This is my book vacation. It was always the highlight of my year. People ask, “How did you know it was really her?” But Oprah’s voice is very distinct. She said she was choosing An American Marriage for her book club, and that she had read it with the girls at her school in South Africa. She told me she thought the book should have a wider readership. I was overwhelmed. I’m getting teary just thinking about it now. I admire Oprah for all the reasons people admire Oprah. But it was especially validating for me to have Oprah, a fellow black woman from the south, endowing this upon me. To be in the Book Club means there’s a sticker on the book, yeah, but there’s a lot of other things that come with it. For instance, Holland America Cruise Line has my book stocked in their reading room, and I got to go on the cruise and have a Book Club conversation with those people. But really, it’s Oprah associating her good name with your book. There’s a lot of publicity. You sell a lot more copies when Oprah touches you. At first, only a few people at my publisher could know about the Oprah’s Book Club pick, because it’s supposed to be under wraps. It felt like I had the biggest secret in the world for months. On the day of the announcement, I remember being in the back of a limo with my publicist Michael McKenzie on the way to CBS This Morning. We were just holding hands, like, I can’t believe we made it. After An American Marriage came out, I still had my normal life for a while, living in my apartment in New York at the top of an owner-occupied brownstone. If I fell out of my bed, I’d land in the bathtub — that’s how I lived! Authors don’t see royalty money for months and months and months. Some writers monitor their sales obsessively, but I’m not such a person. I’ve always looked at royalties checks as kind of a sweepstakes, or like a scratch-off lottery ticket. You don’t know what it’ll be! My book came out in February, but I didn’t get paid until October. When I got the check, I tried to deposit it at an ATM and it was like, “No, ma’am. Not gonna work.” I had to go inside the branch. 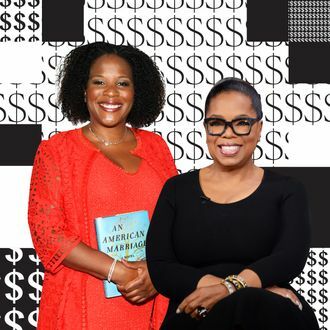 The bank teller looked at the check and then looked at me kinda funny, and I said to her, “I wrote a book, and it’s in Oprah’s Book Club.” I felt shy about it, like I had to explain myself. She said, “Congratulations!” And she told the other tellers and they clapped. Once I did get the money, though, I promptly bought a house in my hometown of Atlanta. Thank you, Oprah Winfrey, for sending me home! I had to buy all new furniture, because previously all my furniture could fit in one room. I’ve always been a person to buy things piece by piece, because I had to, and it was actually very stressful to spend like that. I thought it would be so fun, like someone on a game show, on a shopping spree. But it shook me. I couldn’t talk to people about it, because what a high-class problem, right? Every time I would buy something, I’d think of someone in my life, my family, who could use it more. I thought that maybe I should buy things more slowly, but then, what’s the point of doing that? It still has to be bought. You can’t live your life like you’re always having a “moment,” and that’s why I’m keeping my day job forever. Forever! I’m going to die at my desk. I’m kidding; I think this money will actually allow me to retire earlier than I thought. Now I have the luxury of planning my future, instead of freewheeling into it.